Children are people too. We know that’s obvious, but sometimes parents tend to forget their little ones need the same basic hiking gear as adults. And since they love walking and running even more than you do, they need the best hiking shoes for kids to make the most of it. Quality and craftsmanship are definitely important here because your kid is not going to care where they find their next adventure. 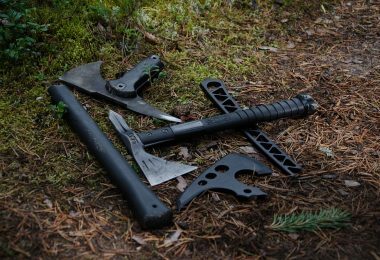 If you’re not sure what to pick, we’re here to help you out with some good advice and 7 wonderful, sturdy footwear to choose from. Yes, that might not seem important to you, but it certainly is for them. Some kids like youthful, playful and bright colors, while others are into a more mature look. Some will even want something similar to what you’re wearing, so it all boils down to finding out your kid’s preferences first. Don’t forget the lacing system either. 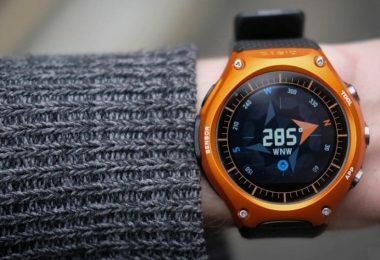 Though you might want something particularly secure, your kids might want something that looks cool, so you need to find the middle ground here. Strong, durable materials like leather and synthetic for the shoes and rubber for the soles. Comfortable features like extra padding. An extra safety like a reinforced toe cap, outsoles that provide extra grip and secure lacing systems. Easy to put on and take off shoes. Waterproof or water-resistant footwear that lets your kid have all the fun they want. Active children that love to run: sweat-resistant, light shoes. Kids that like jumping: padded inner soles and rubber outsoles. Kids who don’t pay a lot of attention and tend to trip a lot: reinforced toe caps. Little ones who love jumping into puddles: waterproof materials. Higher boots for winter, rocky terrain and slippery ground. Ankle-high shoes for warm weather and less steep terrain. Getting the right size is certainly the proper start here. So with kids, you need to pay extra attention to the online size charts and measurements. But some parents would rather buy their little ones shoes that are half a size bigger, seeing how fast kids grow, so they end up lasting longer. That’s not necessarily a bad idea if you can add an extra sock, but don’t sacrifice comfort for a lower price. The best brands on the market offer great hiking footwear for children at affordable prices, so it’s wise to invest in something that fits and that can later be worn by younger siblings or cousins. 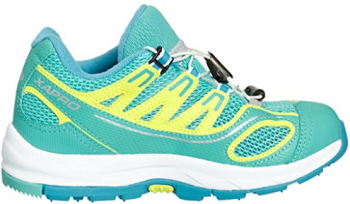 Salomon XA Pro 2 k stars shoes have a price range of $45.00 – $65.00, depending on the size you’ll choose: 1M US or 5M US. The first option is for little kids, aged 4 to 8, while the second one is for kids with ages between 8 and 12 years old. Whichever option you might choose, you should know that you’ve got o good chance it’ll fit right, since the fit as expected rate is 89%. That’s pretty high considering how different kids are. We also love the colors because they’re very youthful and vibrant. The design combines Spectrum Blue, GBlue, and Orange in nonconventional way, kids are bound to like. But that’s not all about the design: the construction is made from excellent materials. 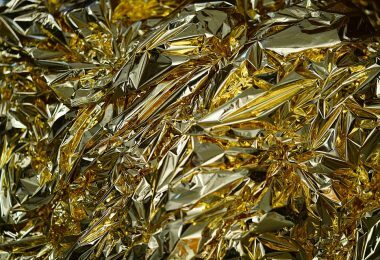 Take the mixture of synthetic and mesh for instance. That’s a good choice especially for summertime when your kids sweat more, and you need a moisture-wicking material. Plus the mesh offers good ventilation and a light overall weight. The sole is great too since it’s made from rubber, which offers a great grip and minimizes the chances of your little ones falling down whilst running. The outsole is contagrip for added stability, grip and durability. 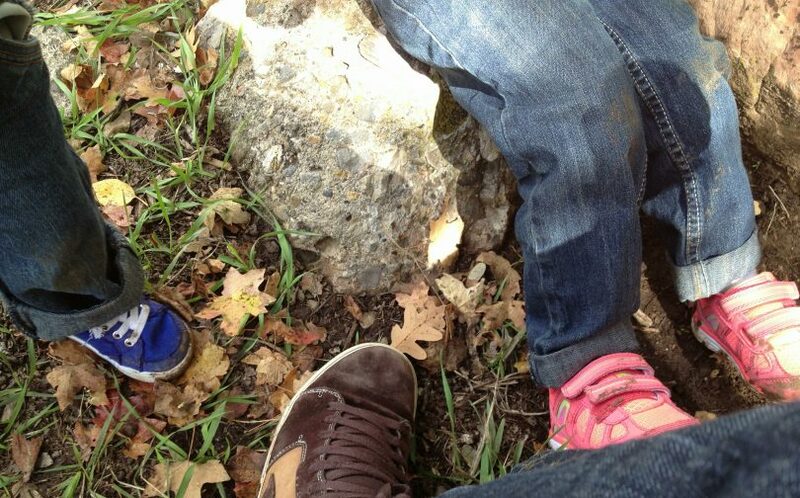 That way even if your kid runs on rocky terrain, they still won’t ruin these shoes. The toe is reinforced for extra protection against all obstacles, and the closure is made of an adjustable bungee to be easily put on or taken off. The tongue and collar are padded, so they too offer great support. The only thing is that they’re only ankle-high so they don’t offer unparalleled stability for mountain climbing, but they’re perfect for a summer hike. 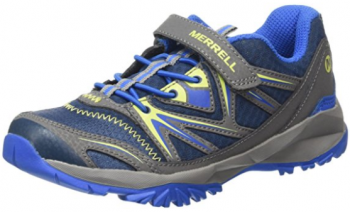 Merrell Chameleon WP shoes have a price range of $24.22 – $49.99, depending on the plethora of sizes you can choose both for little kids aged 4 to 8, or for bigger kids, aged 8 to 12. The fit as expected rate is 75%, so that’s a true positive. However, some of the online reviewers ended up returning the shoes because they didn’t fit on their kids, which explains the average rating. We like the color pattern since it mixes brown and red in a cool way, giving the shoes a really mature look. The whole craftsmanship is cool, using sturdy materials like suede and mesh for the upper to increase the durability and lifespan of these shoes. 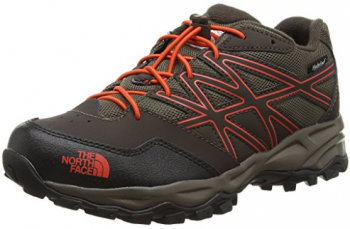 The lace closure is traditional too since it’s a lace-up design, but that means extra protection on the trail. The other materials used are leather and textile for the shoe, which are another classic choice. That means your kid will have a light footwear, that’s resistant to water and moisture wicking. The sole is synthetic for added grip, while the footbed is made from EVA to give the underfoot a plus of protection. Besides, it can easily be removed if it’s warm outside. There are two M-Select features used for the Merrel shoe: the FRESH feature which stops smelly feet, and the GRIP feature that renders the outsoles perfect from a grip standpoint. That’s why you can use these shoes for various outdoor activities that involve a lot of walking and running during the warmer seasons. 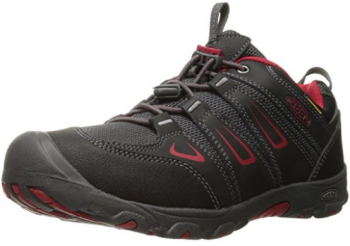 Keen Oakridge WP shoes can be bought in various sizes, for a retail price varying between $49.00 and $65.00. They’re for big kids, aged between 8 and 12, and you can get any size between 1 Youth US and 6 Youth US with a 60% chance you’ll pick the right measurement according to the fit as expected rating. Either way, you’ll get them in a wonderful Black/ Tango Red design that looks more mature, yet modern to fit the tastes of this particular age group. The construction features start with sturdy materials, like the mix of leather and synthetic for the shoe. 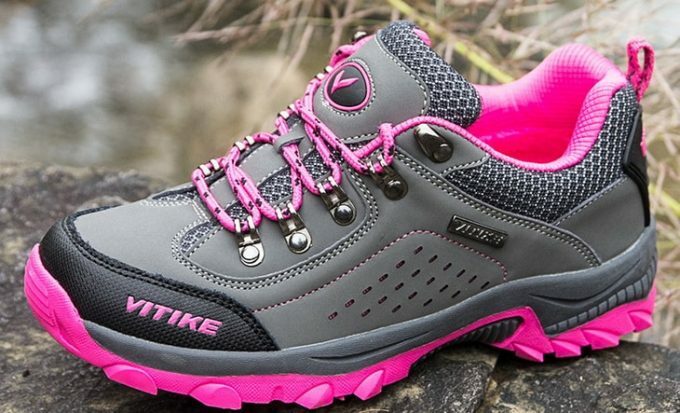 That makes this particular footwear perfect for spring and autumn hikes, seeing as the leather is waterproof and the textile upper is moisture wicking. The membrane is also waterproof, but breathable at the same time for increased comfort. The sole is made from rubber, which is resistant to various on-field damages, providing a sturdy grip. The lace system is bungee and wears the Keen signature, for added support, while the laces are elastic for an easy tie and extra protection. That’s because they squeeze tight and keep the foot tight without becoming uncomfortable. The hook-and-loop closure is secure too, and it makes the shoes easy to put on and take off. 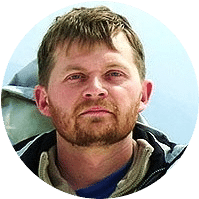 We love how the tip of these shoes is slightly curved, making the Keen footwear more efficient for steep ground because they give an extra bounce. Saucony Excursion Shield shoes can be ordered at a price varying between $39.99 and $55.00, according to a large array of sizes starting from 3.5 US to 7 US. You’ll find these sizes specifically tailored either for boys or girls in the big kids’ group with ages between 8 and 12. This precise sizing is what brought Saucony an impressive fit as expected rating of 90%. The design is modern and mature, with a mix of black and gray that looks awesome on the trail. These shoes are made for running because that’s what Saucony is renowned for, but your kid can definitely use these for hiking too. The hook-and-loop system is secure, plus the sole is very cushiony and stable so these are a good choice for walking hours at a time. The leather and mesh combination is top notch because it provides a shoe that’s resistant to water and sweat, while also being pretty light. The sole is rubber so your kid won’t fall when walking on slippery ground. The outsole is rubber too, but it’s non-marking for an added grip and extra stability. Basically, this is an incredibly light, secure and comfortable footwear for very active kids. The North Face Hedgehog shoes can be bought at a price between $39.95 and $60.00, depending on the size you choose. And you have a lot of options for the Little Kids special size, as well as a wide range of colors to choose from. Their design is mostly comprised out of earth colors like black, brown or tan, but the laces and interiors come in more vibrant colors like pink, orange or lupine. This is definitely a feature your kids will love since it’ll make them look very jaunty. The features you’ll love regard the durable, qualitative construction. This footwear is made from leather, which makes it resistant to various damages. Plus we all know leather ages very well and it’s a light fabric. Leather alone is resistant to water, but thanks to the HydroSeal coating, these shoes are also waterproof. 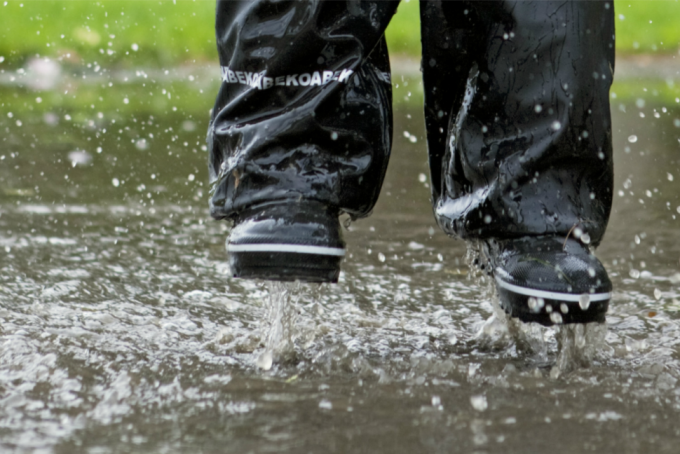 So your kids can run around and jump in puddles all they want without getting their feet wet. The toe cap is reinforced for added protection, while the heel has a mudguard on so the little one doesn’t get too dirty while playing. The tongue is gusseted for extra comfort, while the midsole is compression molded EVA. That means it’s resistant to abrasions, the rubber heel provides extra durability, while the rubberforefoot makes every step very cushiony and comfortable. The Vibram rubber sole is UltrATAc for a secure grip and extra padding on rocky terrain. 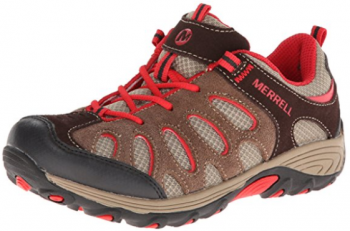 Merrell Capra Bolt shoes have a price range of $29.80 – $65.00, depending on the size you choose. Your options start from a 10 M US Toddler and end up with a 3 M US Big Kids, the fit as expected rating awarded by the online community being a high 71%. The Navy/ Citron pattern looks really modern and bright, so your baby boy is sure to love this combo. 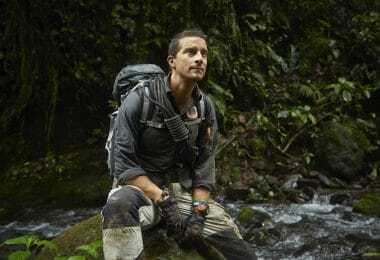 The leather and textile manufacturing renders this footwear perfect for all autumn and spring hikes when you need something water and damage resistant on your feet. Plus, the textile interior provides good moisture-wicking and breathability, so sweat doesn’t become a problem when your kid hikes the whole day. The DRY feature means the membrane is impermeable and therefore waterproof and moisture-wicking at the same time. The FRESH feature which stops any sort of bad smell for your kid’s feet. The GRIP feature which offers durability and improved traction for the outsoles, so your kid stays safe on the trail. Keen Kootenay Winter boots have a price range of $22.99 – $79.95, depending on the size you’ll choose. And you have plenty of options starting with a 1 M US to a 13 M US, with a 72% chance to get the right fit according to the fit as expected rating. There are lots of colors to choose from too besides this Magnet/ Shocking Pink design. All the colors are modern and neutral, which makes a good choice for kids who want to look more mature. 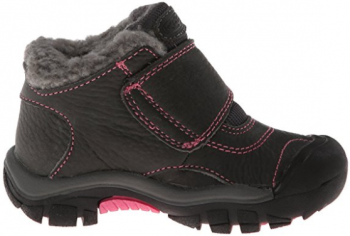 This sort of shoe is great for winter hikes because it has a fleece lining that’s insulating and keeps the kid’s feet warm, as well as a collar that’s padded with trimmed fleece. Apart from extra warmth, fleece provides good comfort and reliable moisture wicking, which is also important during the colder seasons. The rubber sole and rubber traction outsole are sturdy and offer increased stability on a rocky or slippery ground, while the outsole is dual-climate too. This boot is resistant to water since it’s manufactured from leather, so your kid can have all the fun they want jumping in puddles or running on rougher terrain. The hook-and-loop strapping system is another feature that offers extra protection, as does the rubber toe cap that’s resistant to abrasions. Your kid will certainly have a lot of fun with these hiking boots, but they’ll also keep your little one’s feet stable on the trail. The 3 inches high shaft keeps their ankles secure, while the 1.25 inches heel adds some much-needed padding for winter hikes in a mountain area. Or better yet, what does your kid like? While it’s important to get qualitative, comfortable hiking footwear, it’s equally important to get something your kid loves. Otherwise, they’ll stubbornly refuse to wear the shoes you’ve selected, no matter how sturdy they are. So what are you getting? What do you think about the items we’ve selected? Have you tried some of these models before? Do you have a favorite brand that we’ve missed? Are there other pointers to buying kids hiking shoes that we’ve left out? The comments are right below!